ROCHESTER, Minn. — Sister Generose Gervais, long-time administrator of Saint Marys Hospital and president of the Poverello Foundation, passed away peacefully Friday evening in the hospital she served for many years. She was 97. Sister Generose will be remembered for her tireless work on behalf of patients and the staff of Saint Marys Hospital. Her hospital ministry focused on perpetuating the Franciscan legacy, specifically nurturing the values of respect, integrity, compassion, healing, teamwork, innovation, excellence and stewardship among all Mayo Clinic staff. A native of Currie, Minnesota, Sister Generose entered the Congregation of the Sisters of Saint Francis in Rochester in 1938 at the age of 18. She trained as a teacher, but her career took a different path when she attended Stout State University in Menomonie, Wisconsin, to study nutrition. After receiving her bachelor’s degree in 1945, she began a dietetics internship at Saint Marys Hospital the same year. In 1954, she received a master’s degree in hospital administration from the University of Minnesota. In 1971, Sister Generose was named administrator of Saint Marys Hospital. She was the fifth and final Franciscan Sister to hold that post in the hospital that has been built by the Sisters of Saint Francis in concert with Dr. W. W. Mayo in 1889. During Sister Generose’s time as administrator, the hospital saw significant growth. She oversaw the construction of the Mary Brigh Building, which included 40 new operating rooms, 130 beds, two intensive care units, an enlarged Emergency/Trauma Unit and a parking ramp. At that time, the new building was the largest single hospital building project in Minnesota. Following the completion of the building, Sister Generose was named to the new position of executive director of Saint Marys Hospital. As a leader of Saint Marys Hospital, Sister Generose was said to be as comfortable with the complexities of blueprints as she was with making jellies and pickles, one of her favorite pastimes. Her business acumen was clearly demonstrated as she served on numerous boards, including Franciscan Health System, the American Hospital Association and the Catholic Health Association. In 1979, she was the first female member of the board of directors for the Federal Reserve Bank of Minneapolis. Always concerned about patient needs, Sister Generose started the Poverello Foundation, a ministry to help patients of Saint Marys Hospital cope with medical expenses. The foundation has contributed more than $1 million annually to help patients and has assisted nearly 13,000 people since its inception in 1983. Sister Generose was the “face” of the foundation, working diligently on the annual fundraiser where the most sought-after items were her jams, jellies and pickles. Sister Generose stepped down from her formal leadership position in 1985 but remained present and involved in the hospital. She was instrumental in the integration of Saint Marys Hospital with Mayo Clinic in 1986, and helped to create a sponsorship board to promote and preserve the founders’ values and the Catholic identity of the hospital. 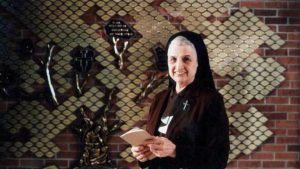 In 1993, Mayo Clinic honored Sister Generose by naming its new mental health care facility on the Saint Marys campus after her. In 2011, she received a Lifetime Achievement Award from the Catholic Health Association of the United States for leadership that extended beyond the local community and served to inspire others. Sister Generose mentored her family of Mayo Clinic staff and exhorted them to live Mayo Clinic's primary value: the needs of the patient come first. She often would reference St. Francis to make her point. “I tell the staff what the beggar told St. Francis — ‘Be sure that thou are as good as the people believe thee to be, for they have great faith in thee,’” she said. “Sister Generose was honest and firm, gentle, caring and compassionate. She demanded the same integrity and excellence from others that she consistently modeled in herself,” says Sister Tierney. “Her empty office echoes the message Francis left his followers: "I have done what is mine to do, may God give you the strength to do what is yours."